From the Visitor Centre go straight ahead past St Peter’s Church (take a peep inside to see the seat tapestries of the various family seats, the coat of arms and the crossed keys for the prisoners), past the old Island Hall (where Sibyl Hathaway encouraged locals to stay prior to the German occupation during World War II), the Fire Station and Chief Pleas rooms (our government and court offices). Go straight over the Clos a Jaon crossroads, heading north to L’Eperquerie Common, passing the new Island Hall, the school and La Seigneurie. 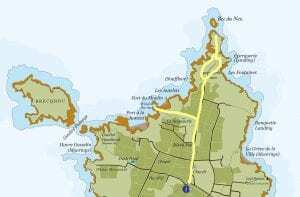 La Seigneurie has been the home of the island’s Seigneurs since 1730. You will approach a T-junction. Continue heading north, signposted L’Eperquerie. The word ‘Eperquerie’ derives its name from the old French word ‘perques’ meaning wooden stakes. Centuries ago the monks who inhabited the island dried fish and eels in the sun. The Common is a typical heathland and the underlying rock is granite. 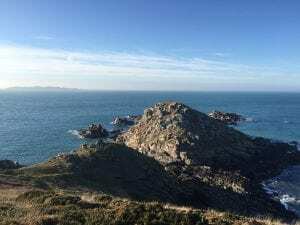 The granite from here was used to build Sark’s lighthouse in 1913. Follow the path down to the wooden barrier and turn right. 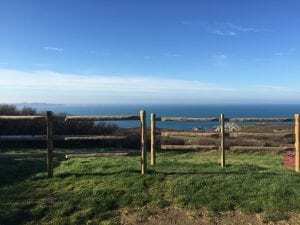 After approximately 100 yards bear left on the path and admire the view of Jethou and Herm with Guernsey in the background. Turn right at the sign for Fountaine Bay and follow the path down, over a little stream, down a set of 9 steps and then down a further set of steps. At the bench follow the steps down and to the left. Stay on the path, bear to the right and at the bottom of the steps take the path on the left, down 3 steps and on the right is the path down to the bay. Do not take the path to the bay but follow the path upwards to begin your ascent. William Toplis enjoyed painting in Fountaine Bay, two prints of which can be viewed in the Toplis Room at the Island Hall: A Fairy Grotto and Fern Cave. Keep following the path upwards until you reach the top. Just above the natural stone steps, look right and see the archway which was the entrance of L’Eperquerie Landing. This landing was Sark’s original harbour and the easiest place by which to approach Sark. As a result, this headland was closely guarded. The archway which would have had big wooden gates to allow carts to pass through. The gates would have been guarded by Sark’s militia and there was a fine if the guards had left the gates open. 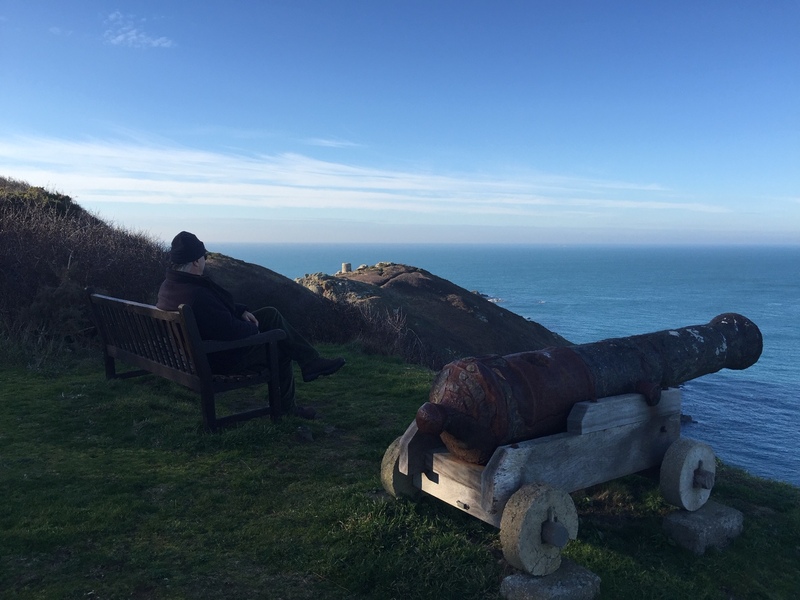 Below, there are 2 upturned cannons salvaged from the Merchant Vessel Valentine on 16 November 1779 and the large rock pool which is perfect for children to explore Sark’s rock pool life either side of low tide. You can follow the path down to the Landing and if you do so, thereafter retrace your steps back up to the ruins of the archway. Continue ascending as far as possible, following the bends in the path. At the top you will see a Georgian cannon still pointing out to sea in its original location. To the left are the remains of one of the militia’s guardhouses which would have been manned to safeguard this vulnerable headland from foreign invaders or pirates. Eperquerie Landing is now below you and the half round tower, or mantlet, is ahead of you. By the Bench and cannon, take the lower path. Note the fort walls on your left but stay on the lower path. The fort walls extended the width of the headland in order to secure it from invasion. It had a square tower at the end which is still clearly visible. The militia also used this area as a shooting range for target practice. At the end of the path, take the path on the right heading towards Bec du Nez, following the path which leads you around the right side of the headland. Please be careful walking over the rocks on the path. Past a narrow chasm, stay on the path (do not take the path to the rocks below), Eperquerie Landing should now be on your right. Stay on the path and bear around to the left. 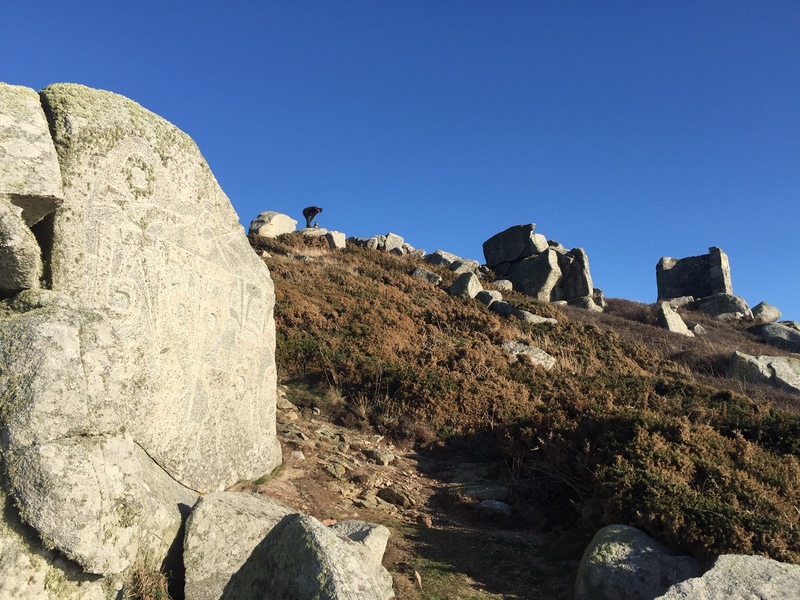 Brecqhou should now be on your right as you approach the Monk’s Stone (a large rock with carving on the side that faces out towards Brecqhou. 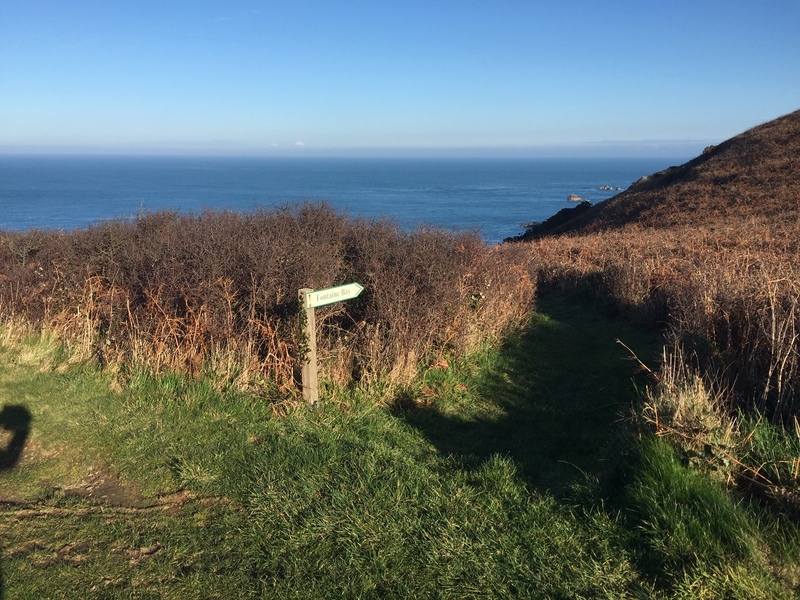 The carving was etched by a buddhist monk from Tibet in 1999 and represents a millennium blessing for Sark. The half round tower lies ahead of you. Follow the path up, past the bench to the sun dial and tower. 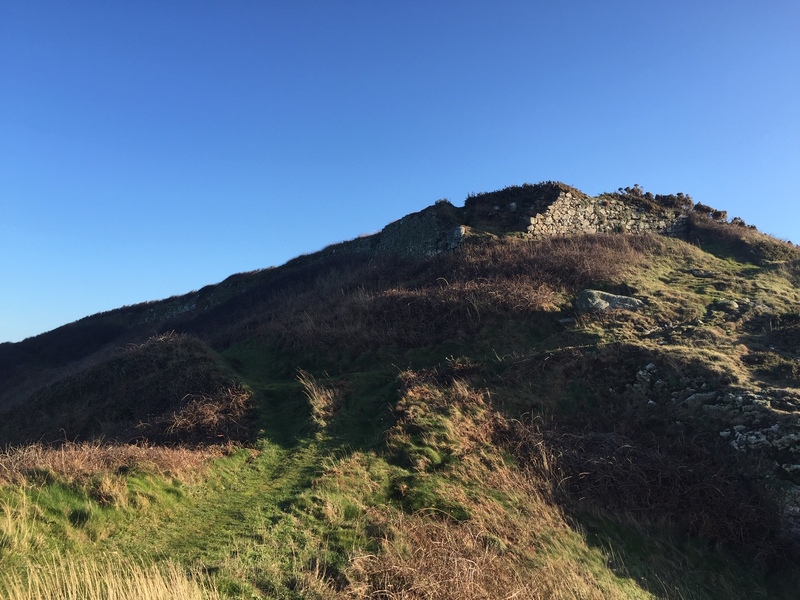 This tower or mantlet has been rebuilt in recent years, but its original purpose was to shelter those who put out targets on this headland during the militia’s gun practice (the retention of the militia was an obligation to the English crown dating back to 1565). 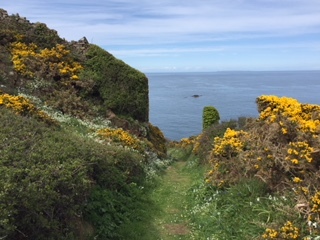 Follow the path back to the fort wall and take the path on the right, following the coast facing Brecqhou (be careful of your footing at the start of this part of the path). Stay on this path on wards and upwards, keeping Brecqhou on your right. 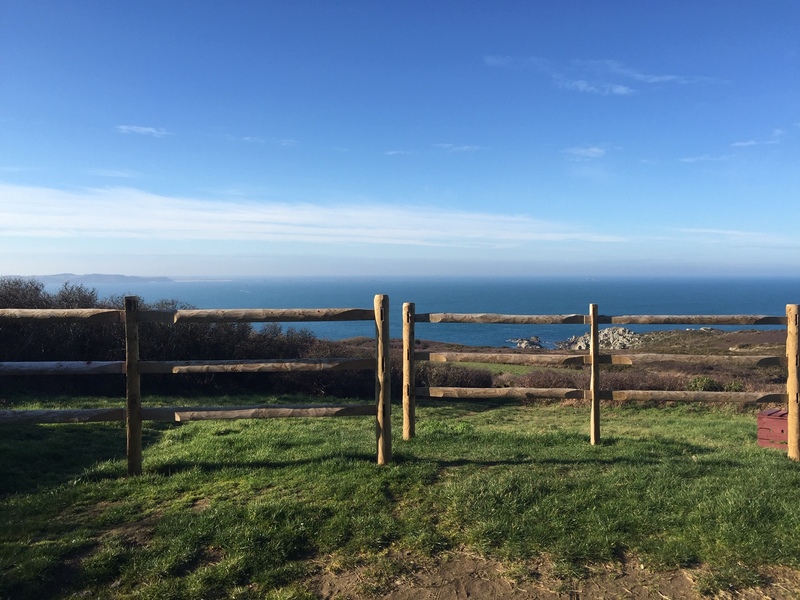 After approximately 0.25 miles from the fort wall, you will be able to admire the view over Les Autelets on your right. These giant rock stacks look like alters in the sea and are home to a large colony of guillemots during their breeding season. These stacks have also been painted by William Toplis and a print of this can be seen at the Island Hall. Continue along the path, turning left just before the bench. At the end of the path turn right to bring you back to the road leading back to La Seigneurie and the village. Go straight on to join the main road and just before you reach La Seigneurie, you will note the sign for Window in the Rock on your right. Follow the sign to Window in the Rock. Walk along this path, past L’Ecluse cottages. At the end of the cottages, there is a path with intermittent steps down to the left. 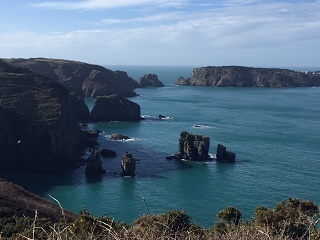 Follow this path to the Window in the Rock: a window framing the tall sea-stacks known as Les Autelets (the Altars). 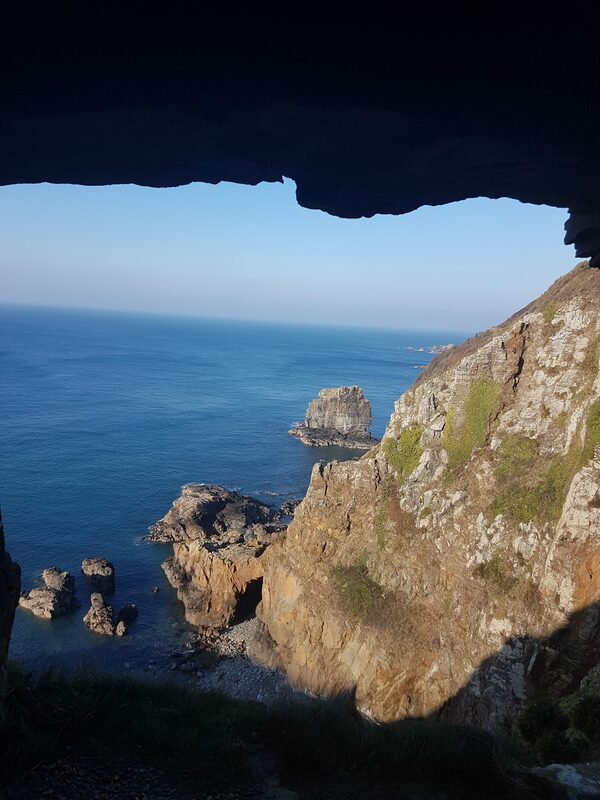 WARNING: The Window in the Rock is a sheer drop with no barriers so approach with caution. 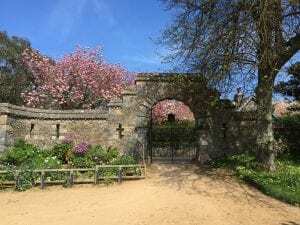 The cliff face was blasted through in the 1850s under the instruction of Seigneur WT Collings (Dame Sibyl’s father, famed to have a violent temper). To the left of Window in the Rock, lies the old winch which was once used to haul up the brown seaweed (vraic in patois) to fertilise the fields. The bay below is named Port du Moulin after the water mill which sat above, originally built by the monks in the 6th century. From here retrace your steps, past the steps leading down to the bay and keep left, following the stream. At the top of the hill, immediately after L’Ecluse Cottages turn right down a lane to the ponds. These ponds are now part of La Seigneurie so please do not wander any further. 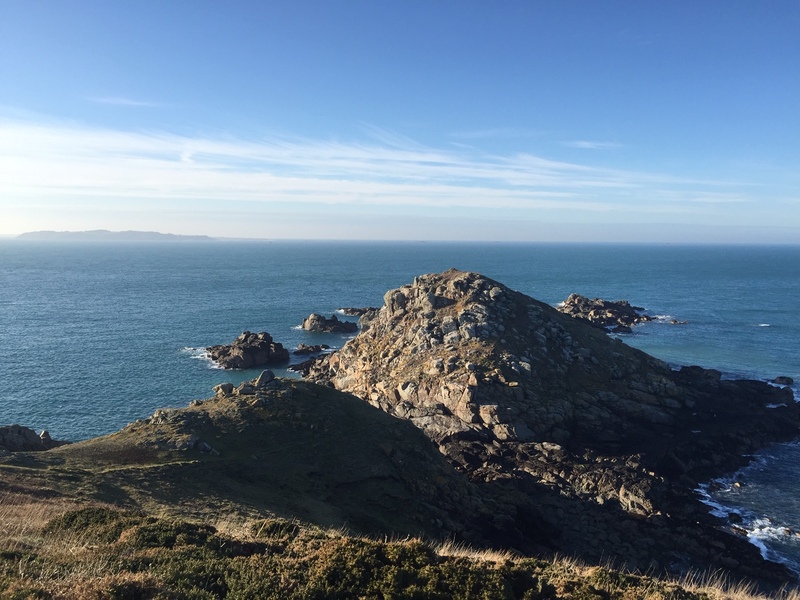 When the monks, led by St Magloire, arrived on Sark in 565 AD, they built 3 carp ponds and a well: both of which you can see from where you are standing. The fresh water stream flowing into the ponds oxygenated the water to keep the fish healthy and powered a mill with the help of the sluice gates (from which L’Ecluse gets its name). Retrace your steps back up to the main path and turn right to bring you back to the main road. At the main road, turn right and within a few yards you will see the Seigneurie walls. Follow the walls to the large gate which marks the entrance to La Seigneurie. This is a good place to stop and refresh as Hathaways Brasserie lies just inside the garden walls and offers all kinds of refreshment. 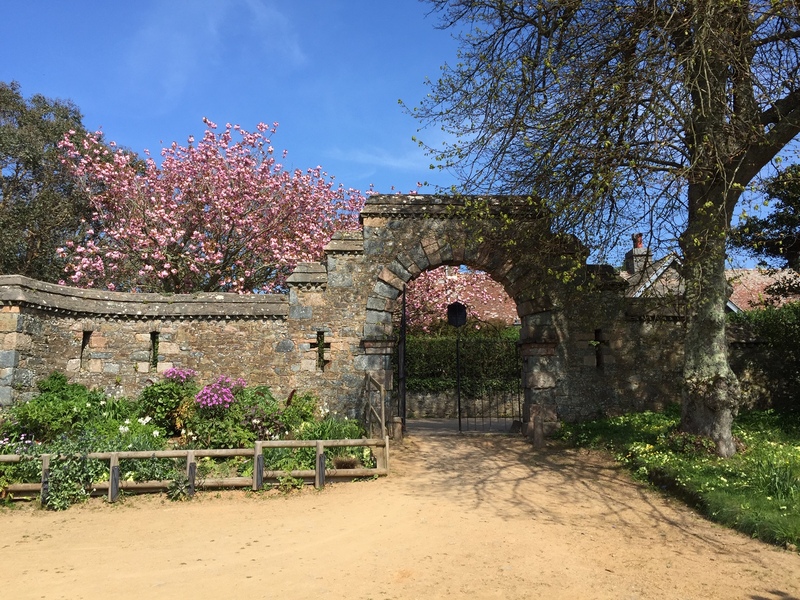 From the entrance to La Seigneurie Gardens, simply head south and retrace your steps to find you way back to the Visitor Centre at the end of the Avenue.